Personalized Laser Pens Custom Printed in Bulk. Promotional, Inexpensive. Budget Prices in USA and Canada. Silver, Red or Blue. A high quality, fine print, metal twist-action laser pointer and pen at a bargain price . The red laser beam projects from the backside at the touch of a button. Ideal for presentations, meetings or pointing to any remote object. Free artwork design. 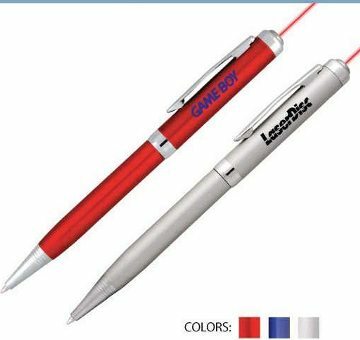 Budget Prices in the USA and Canada for bulk personalized laser pointer pens. American clients pay no taxes. A great promotional or conference gift. We also supply blank (not imprinted) wholesale laser pointer pens for $3.29 each and direct import wholesale laser pointer pens at lower prices (please scroll below our regular Price Table to see the lower factory direct prices) . Price Includes: 1-color, 1-location imprint. Add $0.25 per laser pointer pen for a second imprint color, plus another Setup Charge of $35.00. We also supply blank (not imprinted) wholesale laser pointer pens for $3.29 each (minimum quantity: 50). Production: 3 days after artwork approval; contact us for faster delivery. Blank laser pens ship next day. Packaging: Individual White Box. Optional translucent or metal gift box: contact us for details.